Do mobile phones replace cigarette smoking among teenagers? We included questions on mobile phones in a cross sectional study of 4250 13–14 year old south London school children participating in the five year prospective Health and Behaviour in Teenagers Study (HABITS).6 The mean age of students was 13.8 years and 58% were male. Questionnaires were completed in the classroom between January and December 2001. We assessed current smoking status, mobile phone ownership, who paid for call charges, and sociodemographic characteristics. In our sample 56.5% had never smoked a cigarette, 18.7% had tried smoking only once, 9.9% were ex-smokers, 8% sometimes smoked, 3.7% reported smoking between 1–6 cigarettes a week, and 3.3% reported smoking > 6 cigarettes a week. A total of 75% of the sample owned a mobile phone, of whom 65% paid for their own calls. Mobile phone ownership was positively associated with the extent of smoking experience (χ2(1) = 130.6, p < 0.001). This relation was found in both boys (χ2(1) = 44.7, p < 0.001) and girls (χ2(1) = 91.5, p < 0.001). Among self reported never smokers 68% owned a mobile phone, rising in a graded fashion with increasing smoking experience to 95.5% in those smoking > 6 cigarettes per week (fig 1). Among those who owned a mobile phone, there was no significant association between paying for phone calls and smoking status (χ2(5) = 7.8, p = 0.16). Additionally, among those who smoked and owned a mobile phone there was no association between paying for phone calls and socioeconomic background as indicated by housing tenure and household car ownership. Our findings go against the hypothesised protective effect of mobile phone ownership on smoking uptake. We found a positive association between the extent of smoking experience and the likelihood of owning a mobile. This relation was similar among boys and girls. Rather than competing, mobile phone ownership appears to be a complementary behaviour to smoking, possibly reinforcing a young person’s image of himself or herself as an aspiring adult. Additionally, children who pay for their own calls are no less likely to smoke. This indicates that paying for mobile phone calls does not prevent children from also smoking. Since at this age only 3.3% of the sample reported smoking > 6 cigarettes a week, it may be that, at the observed level of cigarette consumption, mobile phone expenses do not compete with smoking in a significant way. Our study has some limitations. We did not look at the amount of time spent using a mobile phone, or the amount of money spent on call costs. 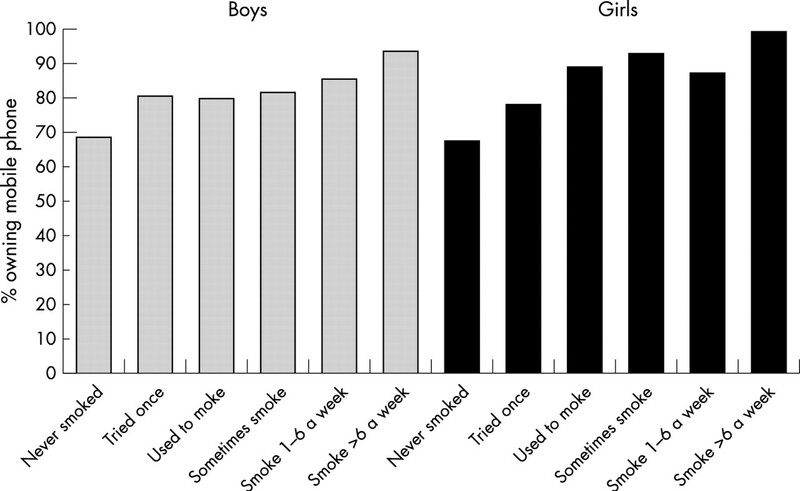 The cross sectional nature of our data precludes an examination of whether mobile phone ownership might in some children have prevented or delayed uptake of smoking. Since we studied only 13 and 14 year olds, we cannot be sure that similar findings would emerge at other ages. Nevertheless, it seems clear that in general mobile phone ownership is associated with an increased rather than a decreased likelihood of smoking in teenagers. Rates of mobile phone ownership by smoking status. Charlton A, Bates C. Decline in teenage smoking with rise in mobile phone ownership: hypothesis. BMJ2000;321:1155. Anon. Youth smoking “is cut by mobiles”. Daily Telegraph20 November 2002. Invernizzi G, Boffi R, Mazza R, et al. Italian data don’t show the same pattern. BMJ2001;322:616. Lee C-Y. No correlation in Switzerland either. BMJ2001;322:616. Koivusilta L, Lintonen T, Rimpelä A. Mobile phone use has not replaced smoking in adolescence. BMJ2003;326:161. Wardle J, Jarvis MJ, Steggles N, et al. Socioeconomic disparities in cancer-risk behaviors in adolescence: baseline results from the health and behaviour in teenagers study (HABITS). Prev Med2003;36:721–30.